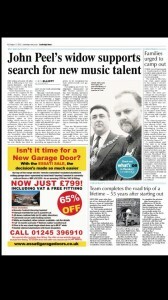 More nominees than ever before! 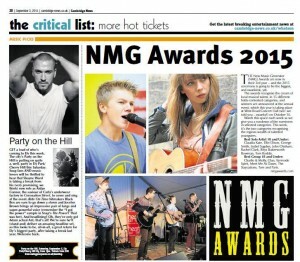 The NMG Awards return for a fourth year with more nominees than ever before! 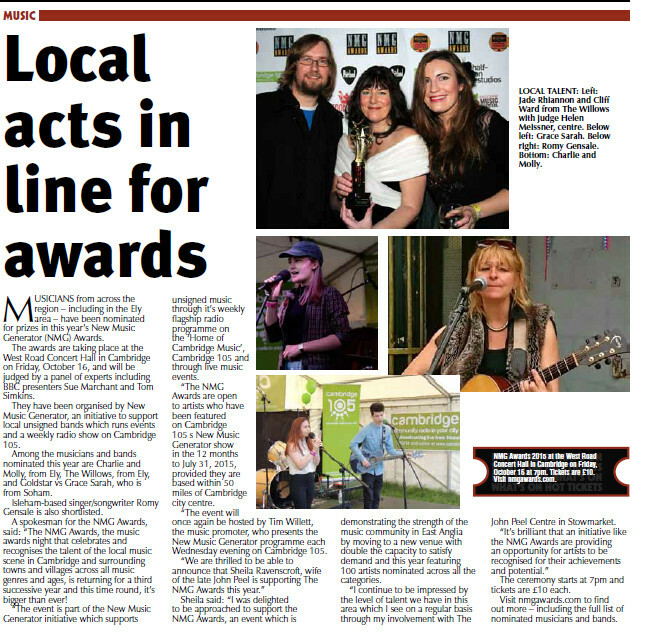 The NMG Awards, the music awards night that celebrates and recognises the talent of the local music scene in Cambridge and surrounding towns and villages across all music genres and ages is returning for a fourth successive year. The NMG Awards evening will take place on October 14, 2016, once again at the 500 capacity all-seater West Road Concert Hall in Cambridge. The event is part of the New Music Generator initiative which supports unsigned music through it’s weekly flagship radio programme on the ‘Home of Cambridge Music’, Cambridge 105 and through live music events. The NMG Awards are open to artists who have been featured on Cambridge 105′s New Music Generator show in the 12 months to July 31st, 2016, provided they are based within 50 miles of Cambridge city centre. 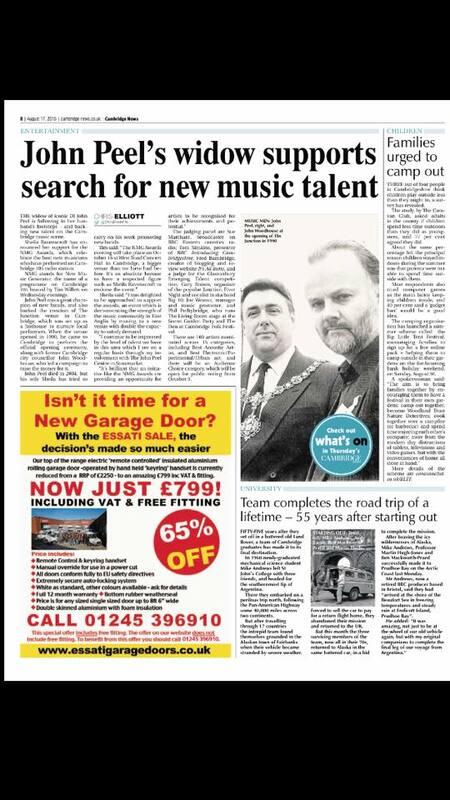 The event will once again be hosted by Tim Willett, the music promoter, who presents the New Music Generator programme each Wednesday evening on Cambridge 105. Sheila Ravenscroft, wife of the late John Peel is once again on board as a supporter in 2016. Sue Marchant, broadcaster on BBC Eastern counties radio and long time supporter of local artists in the region. Tom Simkins, presenter of BBC Introducing Cambridgeshire. Phil Pethybridge, a long time supporter of unsigned music and amongst other ventures runs The Living Room stage at Secret Garden Party and The Den at Cambridge Folk Festival. James Parrish of Prescription PR. James has many years experience of securing bands publicity through press and airplay and also manages Lonely the Brave who are the most recent Cambridge band to make it big on a national scale. There are fourteen categories this year which include an opportunity for the public to have their say in the Audience Choice award. We are pleased to extend our radio broadcast partnership with community radio station, Cambridge 105 in to a fourth year. Cambridge 105 will broadcast delayed coverage of the event on FM, online and DAB Digital Radio. We also have an expanded relationship with Cambridge TV who will also broadcast five 1 x hour programmes of both the launch party and ceremony across Freeview and Virgin Media platforms and produce online content for The NMG Awards website. We are pleased to welcome back Homegrown Music Festival as a sponsor for the third successive year alongside Crooks Hall Recording Studios. THE stars of the Cambridge music scene had their chance to really shine at an awards ceremony in the city last Friday night. 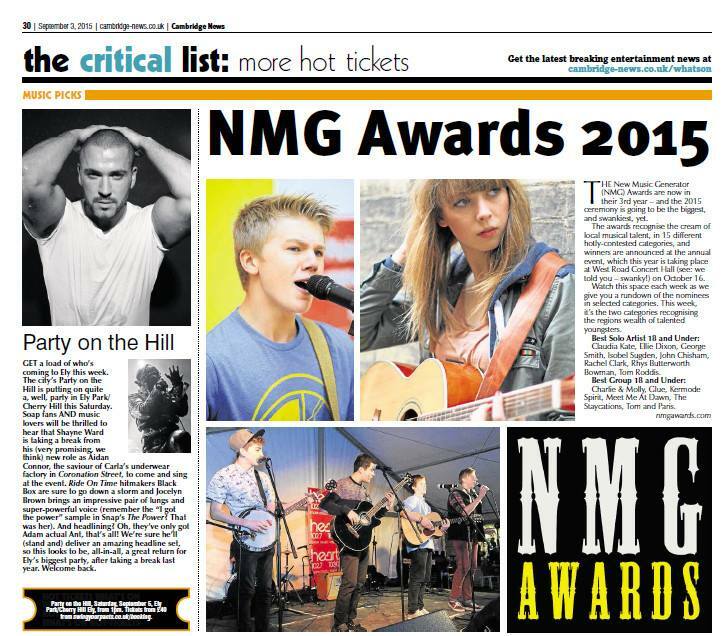 The NMG Awards ceremony, now in its third year, had upgraded from its previous home at popular music venue and pub The Portland Arms to the larger West Road Concert Hall. The awards, which are linked to the New Music Generator (NMG) show broadcast on Cambridge 105 radio, celebrate the musical talent to be found in Cambridge and East Anglia (all nominees must be based within a 50 mile radius of the city).NMG presenter Tim Willett organises the high-profile ceremony, which is judged by a panel including Sheila Ravenscroft, the BBC’s Sue Marchant and Tom Simkins and Phil Pethybridge who runs The LIving Room stage at Secret Garden Party and The Den at Cambridge Folk Festival. All front of house and technical work on the night was provided by a team of Cambridge 105 volunteer members. The glitzy event, which saw nominees arrive on a red carpet to be grilled and photographed by local media, interspersed award announcements with performances from nominees from around the evening. Several artists had accepted the organisers’ challenge to come together and produce a special collaboration for the event, including Tom Lumley and Breakthrough Act winner Oscar Corney; ‘Bearded Busker’ Alton Wahlberg and Dale Bennet (both vying for the Best Solo Male Artist gong, eventually won by Ethan Ash); and a beautifully composed, sung and delivered duet between Melody Causton, two-time winner of Best Female Solo Artist, and Rachel Clark, who bagged this year’s Best Solo Artist 18 & Under prize, as she did, too, in 2014. As winner after winner came to the stage expressing their appreciation for the vibrancy of the Cambridge music scene and the help provided by Tim and Cambridge 105, the importance of supporting local musicians’ fledgling careers was underlined by the inclusion of a series of special Artist Development Prizes, with one-off opportunities handed out to the musician or musicians felt to be most deserving, including a slot at The Big Weekend in Cambridge courtesy of Cambridge Live, radio interviews with Sue Marchant (BBC Eastern Counties) and Tom Simkins (BBC Introducing Cambridgeshire) and a ‘Live Lounge’ recording session courtesy of event sponsors Cream Room Sound Productions. The evening ended with a rip-roaring performance from double-winners CC Smugglers, demonstrating just why they’d been awarded not only the Best Folk/Roots Artist prize, but also the coveted Pride of Cambridge Award, given to an artist who is achieving success on the national stage.